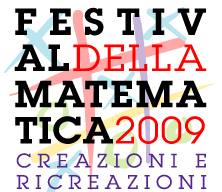 Today I was at the Festival of Mathematics 2009 in Rome to listen a talk by Edward Witten. Witten is one of the greatest living physicists and his contributions to mathematics were so relevant that he was awarded a Fields medal. This was for me a great chance to see him personally and hear at his way of doing physics for everybody. This is a challenging task for anyone and mostly for the most relevant personalities of our community. I was there with my eleven years old son and two of his friends. Before the start of the talk, John Nash come out near our row of seats and my son and his friends suggested to go to him asking for an autograph. Indeed, he seemed in real difficulty as some people was around him asking for an handshaking or something else. Somebody took him away and this was a significant help. I showed Witten immediately at my company. He was there speaking and greeting people around. He appeared a tall and a very cordial man. Marco Cattaneo, deputy director of the Italian edition of Scientific American (Le Scienze), introduced Witten with a very beautiful and well deserved presentation. Witten of course speaks Italian being his wife Chiara Nappi, an Italian physicist. Witten started to talk in Italian saying that he was very happy to be in Italy to meet his wife parents but his Italian was not enough to sustain a talk like the one he was giving. The talk was addressed to a generic public. It was very well presented and my company found it very interesting. Witten did not use any formulas rather than Einstein’s and the parabola and this is enough to keep up the attention of the public for all the time. Witten pointed out that quantum field theory represents the greatest achievement ever for physicists. This theory is so deep and complex that mathematicians still fail to go through it fully and most of these results, widely used by physicists, are presently out of reach for mathematical proofs. He also said clearly, showing it explicitly, that the problem implied in the vertexes of ordinary Feynman diagrams are removed by string theory making all the machinery less singular. He did a historical excursus starting from Einstein and arriving to string theory. He showed the famous Anderson’s photograph blatantly proving the very existence of antimatter. A great success of the wedding between special relativity and quantum mechanics. This wedding produced such a great triumph as quantum field theory. Witten showed this with the muon magnetic moment, emphasizing the precise agreement between theory and experiment, but saying that the small discrepancy may be or not real new physics being just at . He emphasized the long path it takes to physicists to achieve our present understanding of quantum field theory and cited several Nobel prize winners that gave key contributions for this goal. He pointed out the relevance of the seventies of the last century that become a cornerstone moment for our current view. Starting from Gabriele Veneziano‘s insight, Witten arrived to our current view about string theory. He said that this theory has had some frailty aspects that put it, sometime, on the border of a gulch. But, as we know, recoveries happened. He said that strings set the rules and not the other way round as happens with the Standard Model. He gave the example of the Veneziano’s model for strong interactions that was there pretending spin two excitations. This made the model better suited for other aims as indeed happened. Witten hopes that LHC will unveil supersymmetry. He showed a detector of this great accelerator that we will see at work at the end of this year. Discovery of supersymmetry will be a great achievement for humankind as it will be the first evidence for a world with more than four dimensions. Anyhow, Witten said, string theory put out several elements, quantum gravity and supersymmetry are two of them, that make this theory compelling. After the talk, some questions by the public were about ten or eleven dimensions in string theory. Witten avoided to be too technical. But the most interesting question was the one by Marco Cattaneo. He asked about critics of string theory and its present inability to do predictions. Witten’s answer was quite unexpected. He said that it is a good fact that a theory has critics. It is some kind of praise for it. But he also said, and his answer was quite similar to the one of Nicola Cabibbo, that there are a lot of things to be understood yet but such a richness physicists run into cannot be just a matter of chance with no significance. Surely, this has been a very well paid waiting! This entry was posted on Monday, March 23rd, 2009 at 12:12 am and is filed under Events, mathematics, Physics. You can follow any responses to this entry through the RSS 2.0 feed. You can leave a response, or trackback from your own site.